Tattoos are a way to express their interests, a way to express the affection and love towards their loved ones, a way to show off their passion etc. Traditional tattoos that were pierced were done for identification of a group, to show the particular status of the individual such as married, ready to get married etc. People who love the concepts of Halloween and the haunting would love to have the Halloween tattoos pierced. 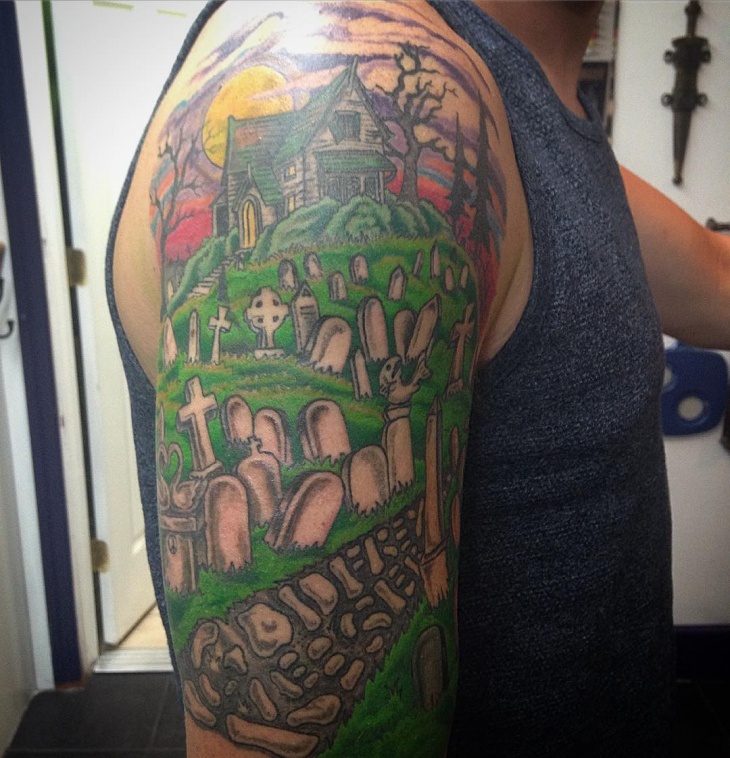 This colorful and natural setting of a cemetery and haunted house with the moon makes it a wonderful tattoo to have for anyone believing in haunting and the underworld. This tattoo is a good one to flaunt in Halloween parties or vampire parties. 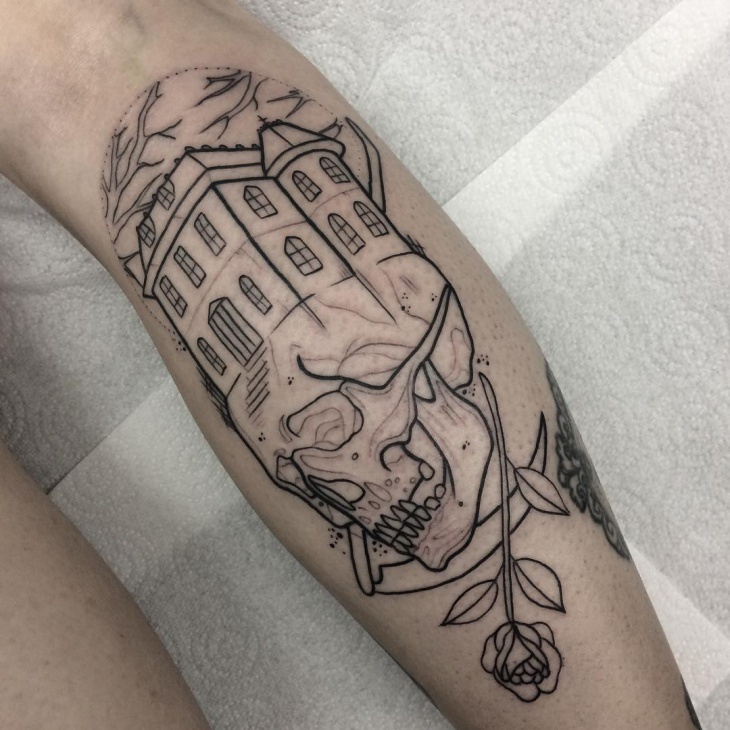 This haunted house in a skull tattoo which is done in black ink on the shoulder adds an element of haunting to the body and will be loved by everyone who strongly believe in haunting. This scary tattoo is a good one to flaunt on scary movie nights or horror movie night. 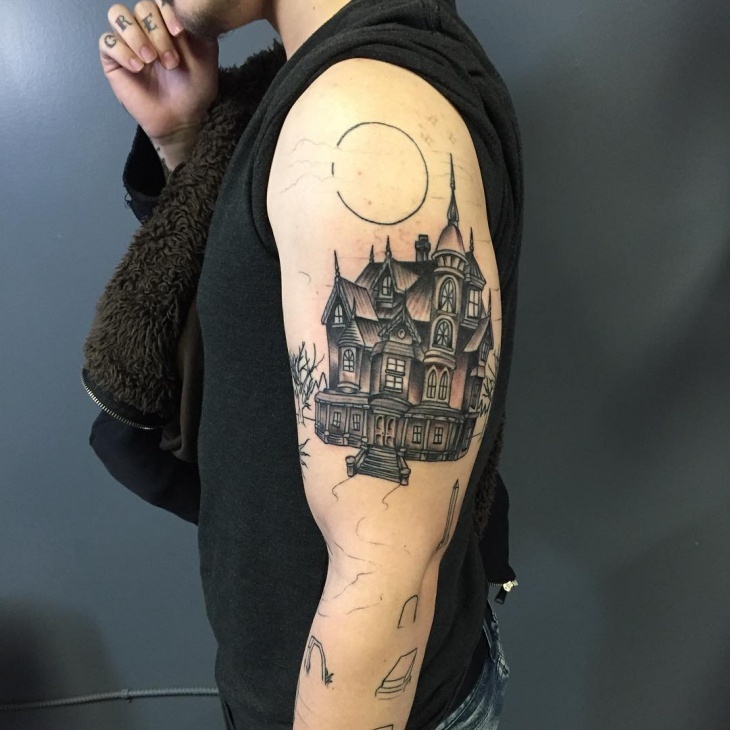 This haunted house tattoo done on the sleeve is beautiful. The shades of black and red bring a vision of haunting and the underworld. This tattoo is going to turn heads because of its intricate designs and work. 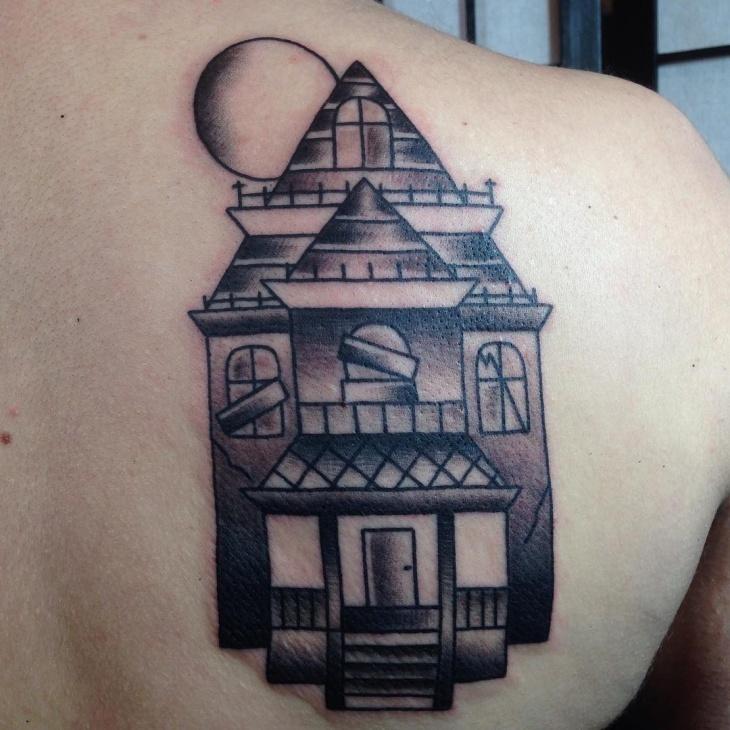 This amazing haunted house tattoo design on the back is beautiful in shades of black. This amazing tattoo will be loved by all followers of haunting concept. This simple tattoo is good one to flaunt with any dress. 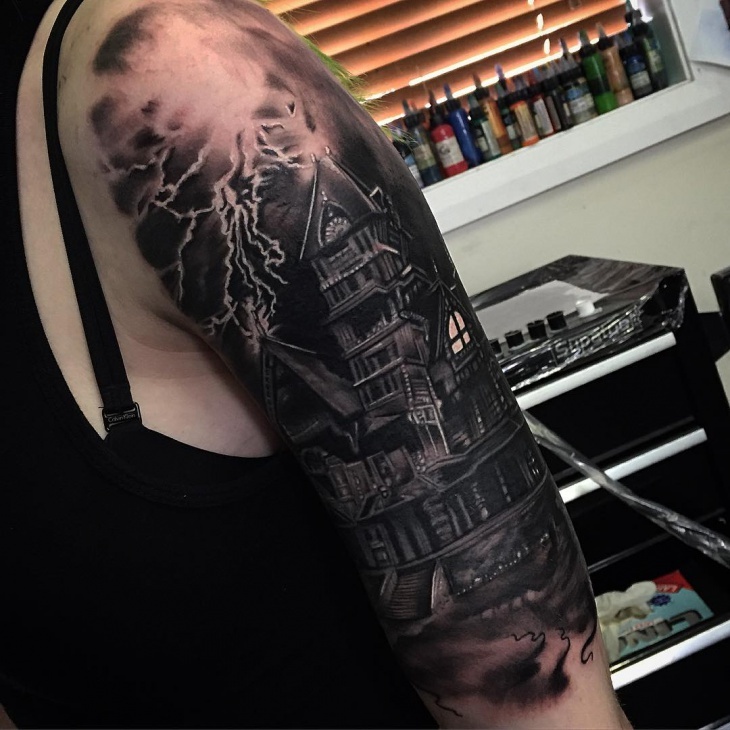 This ideal haunting mansion tattoo with black ink is looking natural and realistic. 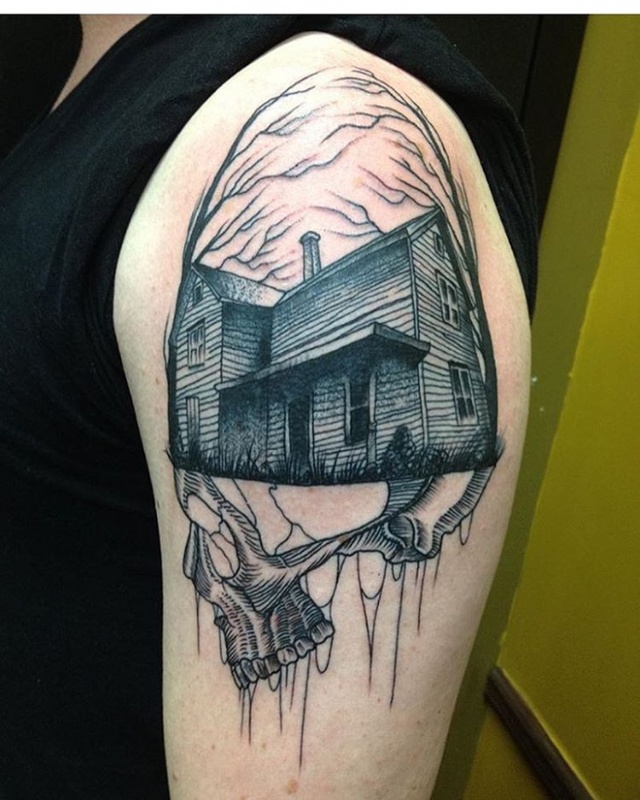 The shades are beautifully done and this tattoo will look good on every haunting tattoo lover. Get this tattoo pierced and get ready for the Halloween party! 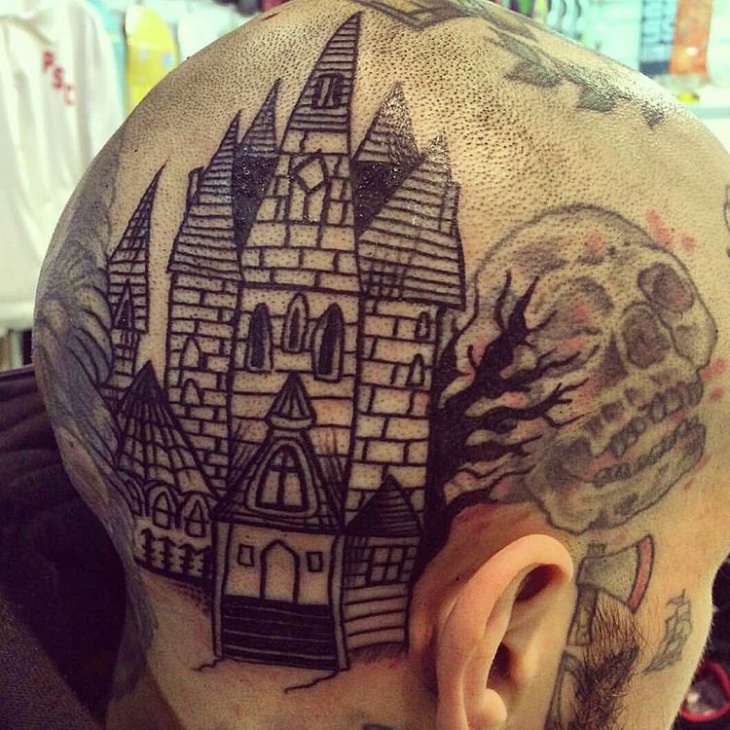 This black and grey haunted house tattoo looks really scary. 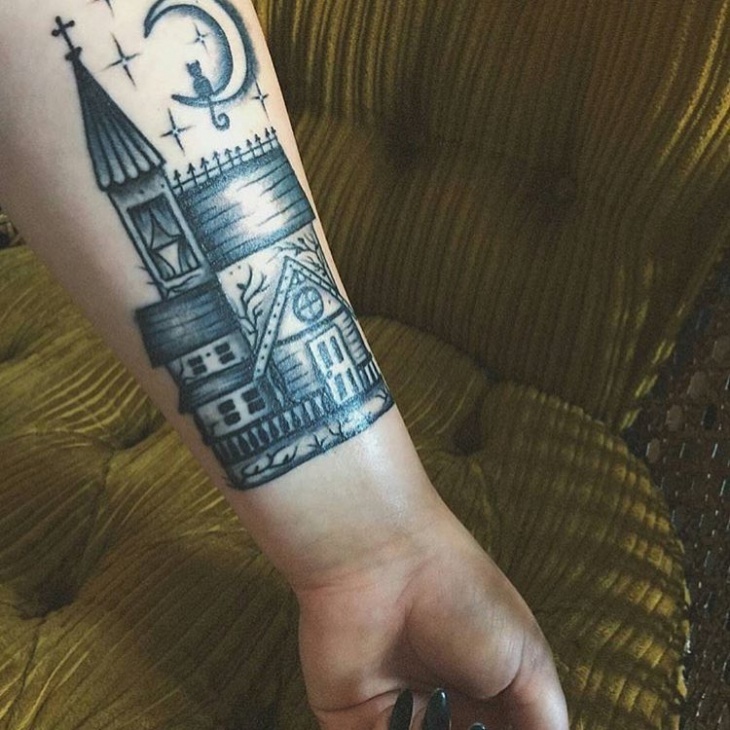 This tattoo done beautifully with shades and inclusion of bats and cemetery make it look with an effect of moonlight surrounding the house makes the tattoo look realistic. 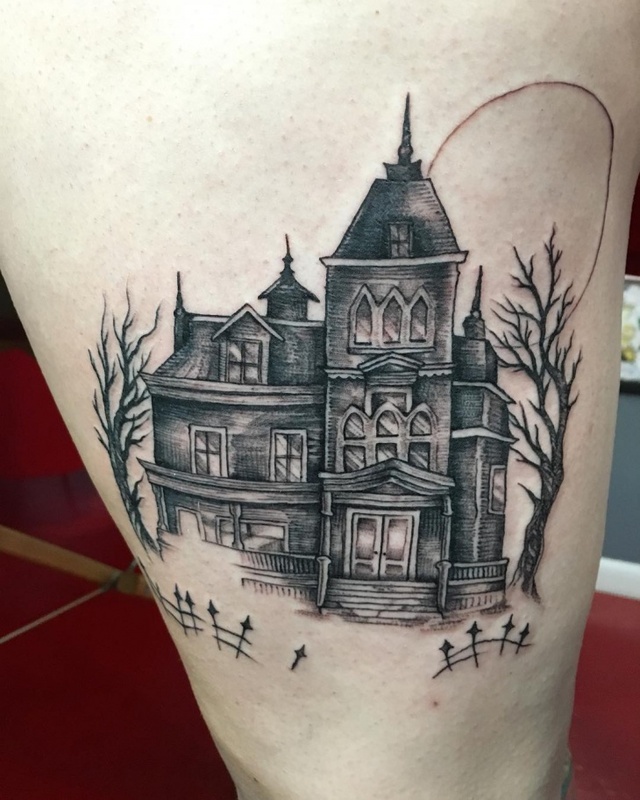 This scary and realistic dark haunted house tattoo on the leg is looking fabulous. 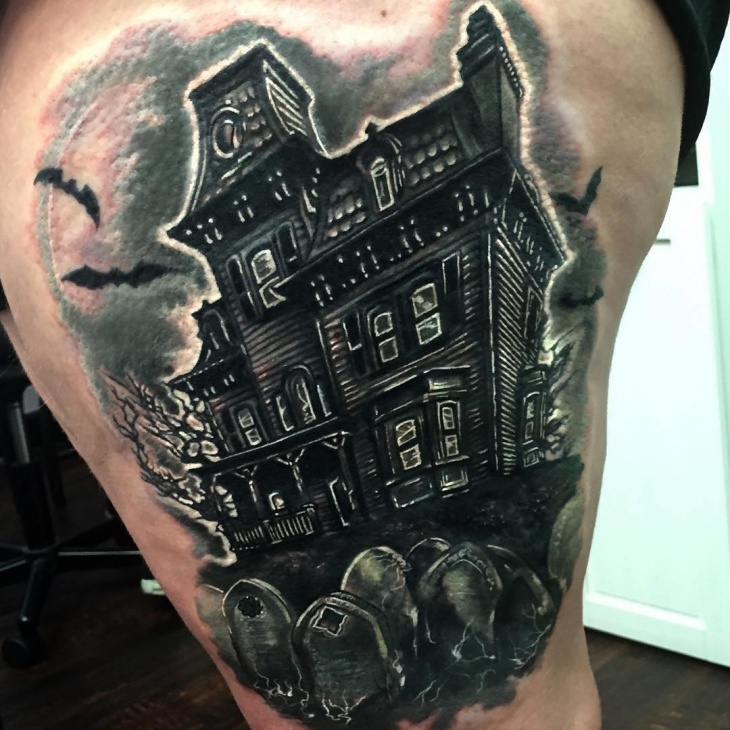 This sure will be the favorite of all haunted tattoo lovers. 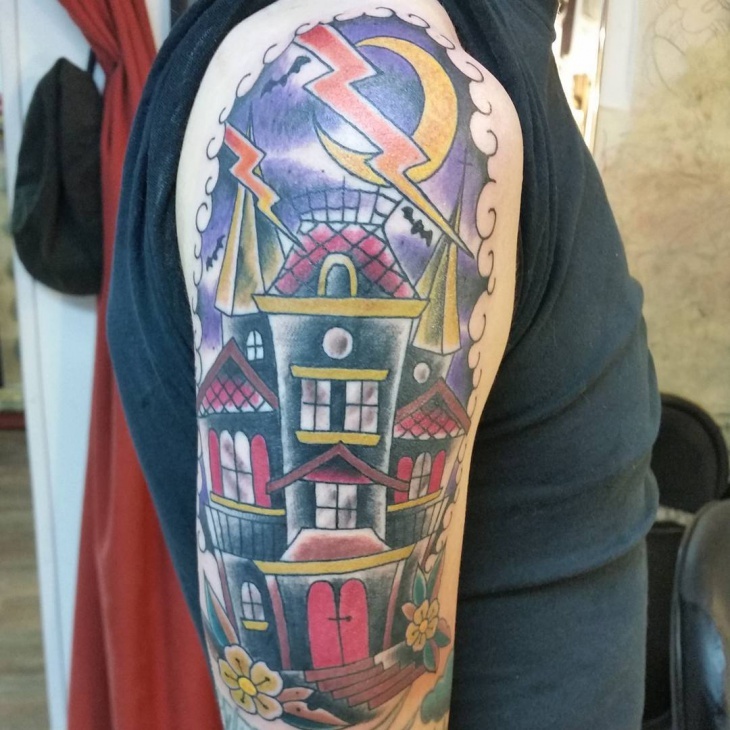 This bright and colorful haunted house tattoo with haunted house, full moon, bats and scary demon in the picture takes us into the scene and makes us feel it. This tattoo on the full sleeve is kind of a body art which adds an element to the person. 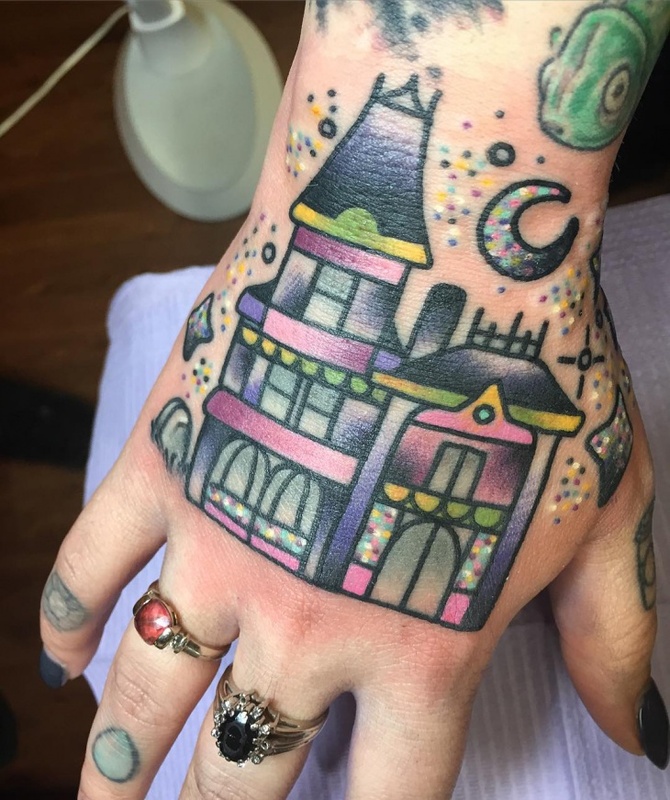 This cute and beautiful haunted tattoo in colors of black, pink and yellow on the palm is adorable. This cute tattoo suits everyone and a very good piece to flaunt. 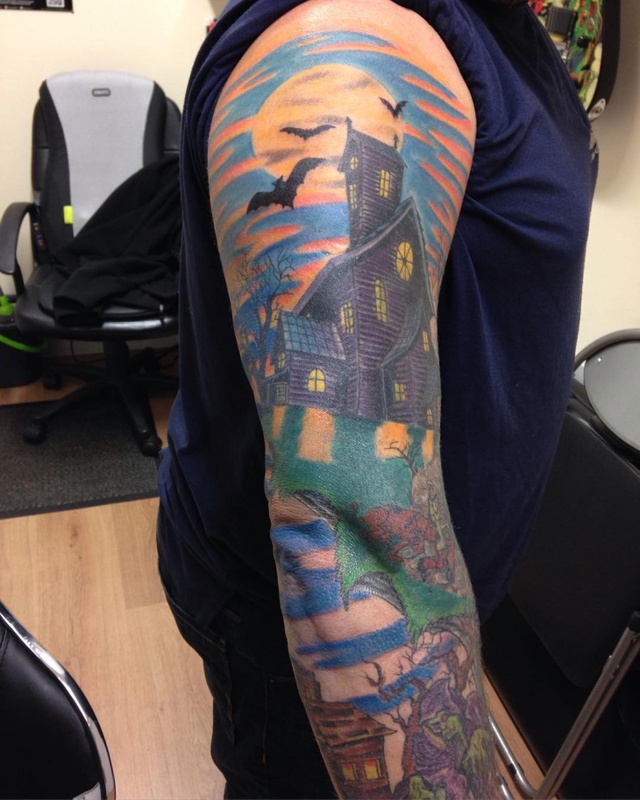 This haunted house tattoo on the arm is scary and at the same time a piece of art. 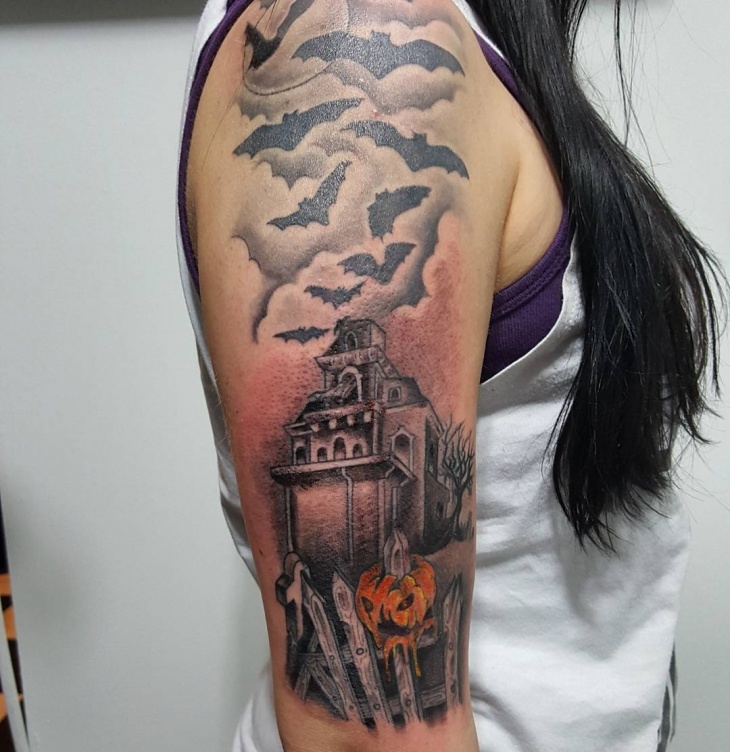 This beautiful tattoo will be loved by all the haunted house tattoo lovers and the vampire lovers. The tattoos are the art of expressing their ideas and ideologies. The tattoos are considered to be an essential part of their life in many African, Russian and Polynesian countries. The Polynesian tattoos are pierced to show their bravery, the belongingness to a group or sect, the marital status of a woman etc. 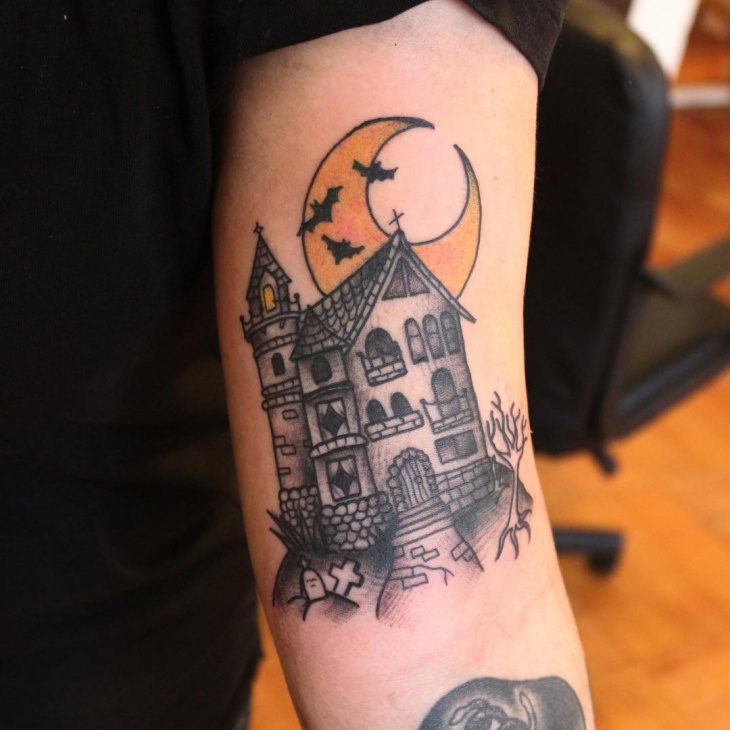 Along with haunted house tattoos, tribal tattoos and zombie tattoos are trendy now and all tattoo lovers who follow underworld and vampires love to have these tattoos.